A skin sensitivity test must be carried out 48 hours before application Final colour result will depend on the colour, thickness and overall condition of your hairso a colour strand test, prior to full application, is recommended. 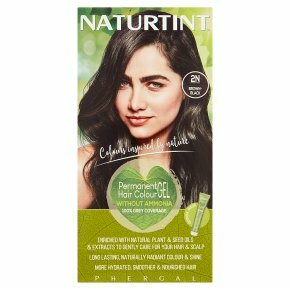 Choosing the Best Colour for You You can go as dark as you like with Naturtint®When lightening your hair, only lighten by up to 2 shade numbers at a time. Read the instruction leaflet inside the box carefully. HAIR COLOURANTS CAN CAUSE SEVERE ALLERGIC REACTIONS<br><br>Read and follow instructions. This product is not intended for use on persons under the age of 16. Temporary ''black henna'' tattoos may increase your risk of allergy. Do not colour your hair if:<br>You have a rash on your face or sensitive, irritated and damaged scalp.<br>You have ever experienced any reaction after colouring your hair.<br>You have experienced a reaction to a temporary ''black henna'' tattoo in the past.<br>Contains phenylenediamines and hydrogen peroxide. Do not use to dye eyelashes or eyebrows. Avoid contact with eyes.<br>Rinse immediately if product comes into contact with them.<br>Wear suitable gloves.<br>The proportion for mixing colourant and colour developer must always be 1:1. Rinse hair well after application. A sensitivity test should be performed each time and before using the product.